I’m very excited about my trip to Cambodia in December, so much so, that I’ve already started to look at what I’m going to be eating when I’m there. 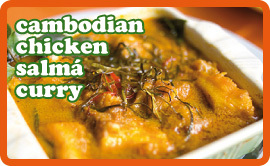 This is a lovely delicate curry which is their most popular dish. The original recipe didn’t contain any heat so I added a little chilli powder to make it more memorable. In a food processor or with a hand blender, blend the ginger, lemon grass, chilli powder, fish sauce, vinegar, lime zest, salt, pepper and turmeric into a smooth paste. Heat a large pan or wok over a medium heat and fry the paste for 2-3 minutes. Add the chicken and stir continuously for 4-5 minutes. Add the stock, sugar and coconut milk. Bring to the boil, reduce the heat to low and simmer gently for 45 minutes until the chicken is tender. Remove from heat.